Deborah’s Place offers several temporary housing programs for women. Each home varies in size, accommodating between 15-90 people. Can serve up to 12 men and 8 women. Intakes are by appointment only by calling 847-424-0945 ext. 15. Clients must arrive by 7 p.m. and depart by 7 a.m.
Lockers are available for people to keep their belongings during the day. Homeless women with kids and families should phone 847-424-0945 ext 15. Provides overnight shelter for homeless women aged 18 and over. Referrals are accepted from DHS and the Police Department. Provides emergency overnight shelter for men (215 beds) and women (35 women). A soup kitchen is also available. Provides respite care and shelter for homeless single adults, ages 18 and older. Respite care is typically available for broken bones, gunshot wounds, post-surgery care, infections, chronic health conditions (including hypertension and diabetes). Case management, SA counseling, housing assistance are also available. Program provided by Breakthrough’s Women’s Services which provides support for women in crisis. Programming focuses on both emergency and long-term needs and is designed to help women break the cycle of homelessness, abandonment, addictions, domestic violence and abuse. Intake opens at 7:30 p.m. every evening. Phone lines open Monday through Friday, 9 a.m.-3 p.m. Serves women and children (girls must be under the age of 17, boys must be under 10 years old). Single women must be at least 18 years of age. Domestic violence cases are not accepted. Only DHS referrals are accepted. Provides quality housing and support services to HIV women, children and/or homeless, families, and pregnant/parenting teens. If you need to reach bus personnel before the bus leaves for the night, leave a voicemail here. Serves youth and adults who face multiple complex challenges on a daily basis, including homelessness, poverty, abuse, loneliness and neglect. Serves homeless youth (not DCFS wards), ages 14-21. Any runaway or homeless youth who are not wards of the state and his/her children will be accepted, providing space is available. This agency provides emergency shelters for male / female adolescents aged 11 – 17. Two shelters are available. The typical stay is 2-3 weeks. A group home-longer is also available for longer term stays. The group home accommodates up to 6 males aged 16-18. Only DCFS wards are accepted for the group home. The agency also provides a Healthy Families child abuse prevention program for new mothers or pregnant moms. The initial screening may occur in a hospital or the client may be assessed after the pregnancy. The client must be willing to participate in the program and qualify with certain risk factors. This program offers support for parenting, child development, and dealing with new family dynamics. Counselors will help with any familial issues. Clients may participate in this program for up to 5 years. A traditional and relative foster care program is also available for DCFScases aged birth to 18. Sliding scale fees are available for all programs. Tabitha Community Services, Inc. is dedicated to servicing the immediate and long-term needs of the less fortunate in Chicago with emphasis on programs for victims of domestic violence and homeless women and children. Maximum occupancy is 60 beds. This agency provides services for victims of domestic violence, homeless women and children, recovering substance abusers, fire victims, those in need of clothing, furniture or food, work and training program participants, residents, and clients from other programs. The typical length of stay is three months. However those with extenuating circumstances can stay for 4 months. Teen Living Programs offers a variety of services to adolescents aged 14 – 21. The program offers a 24 hour crisis hot line. 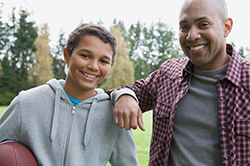 A group home is also available for male / female adolescents aged 14 – 21. Facilities are not available for pregnant or parenting teens. In addition, short term shelter is also available for short term placement (usually 2 weeks). Teen Living Programs also provide a transitional living program for youth aged 18 – 21. Call for information to assist runaway, homeless or abused youth. The program also provides resources to help with education issues or job placement. All placements at the Teen Living Program are voluntary. Facilities are not available for youth who are physically aggressive or have been diagnosed with severe mental illness.